In today’s update, we’ve added the ability to create a new Goal right from the New Task screen. The “Goals” in Simply Goals & Tasks function like categories when you are managing your tasks. It’s a way to organize your different types of tasks, color coordinating them, and making it clear when a task aligns with something important (or not important) to you. We hope all users take the time to think about their goals. To think about what they need to spend time on, what they want to spend time on, and how much their ideal distribution of time matches their reality. But we know that there are also plenty of users that just want a to-do list. 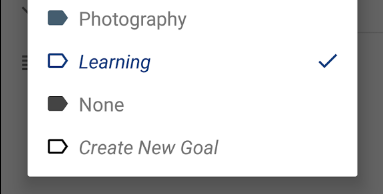 And for them as well as anyone just starting with the app, it will be easier to add Goals (aka Categories) right while they are adding tasks.